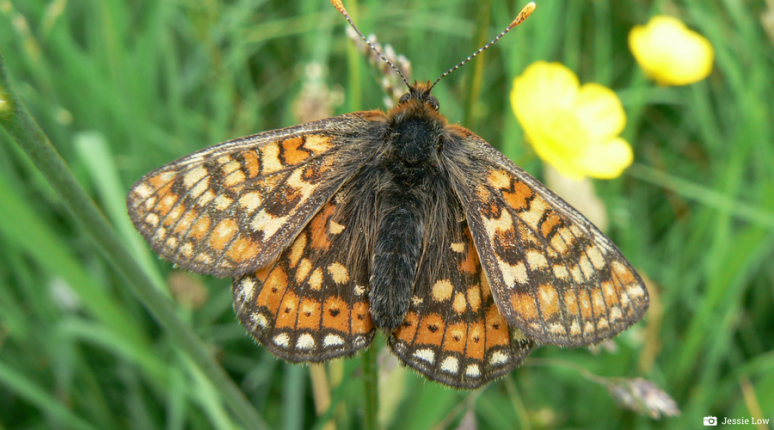 The Marsh Fritillary is a threatened species, not just in the UK but across the whole of Europe, it is protected under the 1981 Wildlife and Countryside Act, listed on UK BAP and section 41 of the NERC Act in England and Wales. The butterfly is primarily found across south-west England with small populations in the north-west and into Scotland, making Wiltshire a core hotspot for the species. Marsh Fritillary caterpillars main food plant is Devil’s-bit Scabious (Succisa pratensis), primarily found in damp meadows, marshes and riverbanks. In more calcareous areas caterpillars will opt for Field Scabious (Knautia arvensis). As a result the main habitat of the Marsh Fritillary is damp or chalky grasslands. It is a highly volatile species that requires extensive habitat networks to thrive and the slightest barrier, such as a hedge or river, will prevent dispersal. They are under threat from habitat loss along with larval parasitism by the parasitic wasp Cotesia bignellii, for which the Marsh Fritillary is its only host. Jones’s Mill nature reserve is a fen, made up of woodland, ponds and wet grassland. It is home to wildlife that thrives in wet conditions, including Devil’s-bit Scabious. The maintenance of meadow and marsh areas such as this essential in the protection of these beautiful butterflies and it is very promising to have them return to Jones’s Mill after such a long absence. If you see any Marsh Fritillary butterflies when out and about in Wiltshire please let us know!